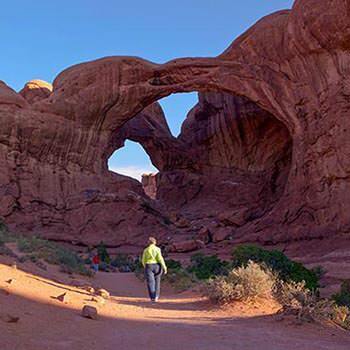 "Our Arches National Park Tour was EXCELLENT!" Stuarts knowledge of the area was impressive and his presentation was informative and entertaining. The tour was excellent! I never have been a fan of tours, so I was surprised when this tour became one of the highlights of our trip. The bus was comfortable and the guide was excellent. Stuart was professional and extremely knowledgeable on our Arches Sunset Tour we booked with you. On our sunset exploration of Arches National Park, he often brought up the rear to make sure no one was left behind or got too far out of range. He is an excellent teacher. An excellent guide.